Encounter: Whale Sharks and Manta Rays. 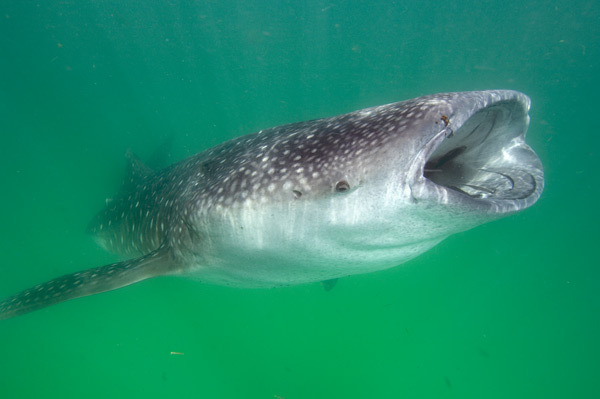 The world's largest aggregation of Whale Sharks can be seen at the very tip of the Yucatan Peninsula, near Isla Holbox. A marine park has been created to protect the sharks while they are in the area and from June until the end of August half of the local fishermen become tour guides. The rules governing the interaction are fairly strict and no scuba equipment is allowed. On snorkel however, it is possible to get extremely close to the massive sharks and it is quite normal to find multiple sharks feeding together which leads to extraordinary chances to watch their behavior. Manta Rays are also protected in the park but snorkelling encounters with them tend to be brief because they are easily startled. No flash photography is allowed, and officially you must remain more than 2 meters from the sharks but in the plankton rich waters it is difficult to see the sharks from that distance and after the first couple of snorkels the guides usually turn a blind eye to snorkellers that are bending this rule as long as the sharks are not acting as though they are being harassed. Operators: More than 80 tour boats have permits to enter the park from Holbox and another 50 make the longer trip from Cancun so it is best to arrange a tour once you arrive on the island. The prices and service are fairly standard but some things to look for in an operator include the number of people on the tour (the maximum is ten passengers but in smaller groups you will get more time in the water) and whether the boat has a fly bridge or a raised viewing platform. This with give you better opportunities to see and photograph the sharks from the surface. 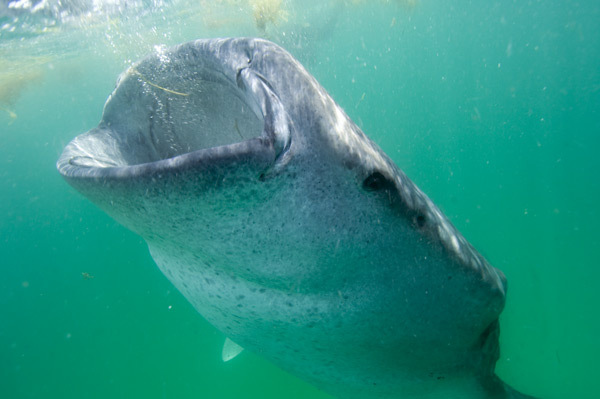 If you want to really concentrate on the sharks and 'talk shark' for the whole time you are there, Shark Diver Magazine organizes one or two trips during the season that are all inclusive and structured to allow the maximum time possible with the Whale Sharks. Directions and Accommodation: Holbox Island can be reached by a combination of minibus and ferry from the airport and Cancun Town, or by small plane directly from the airport. Make arrangements at the ground transportation desk or negotiate directly with a taxi/minibus driver. The trip from the airport takes around 3 hours by land. Accommodations on the island range from Spartan cabanas on the beach and cheap hotels in the town center (about $50 per night) to luxury self contained resorts. If you prefer the latter it would probably be best to research the accommodation options and book before your arrival. The town fills up with local tourists from Cancun over the weekend so it is much easier to find a bed during midweek.